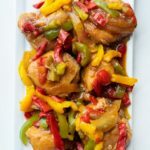 This is one of my favorite boneless chicken thigh recipes because of how juicy the meat turns out! This recipe is absolutely not dry! It’s filled with so much flavor! 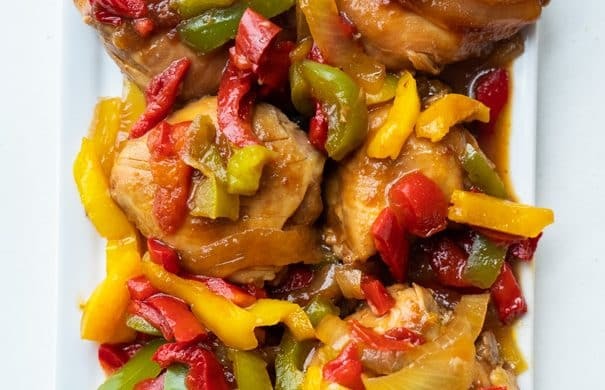 The chicken is cooked with frozen peppers (added for the last 30 minutes) to make a delicious meal. To make it a complete dinner, I always serve this on rice. I’ll add rice to my rice cooker towards the end so everything finishes up at about the same time. It’s such an easy meal! 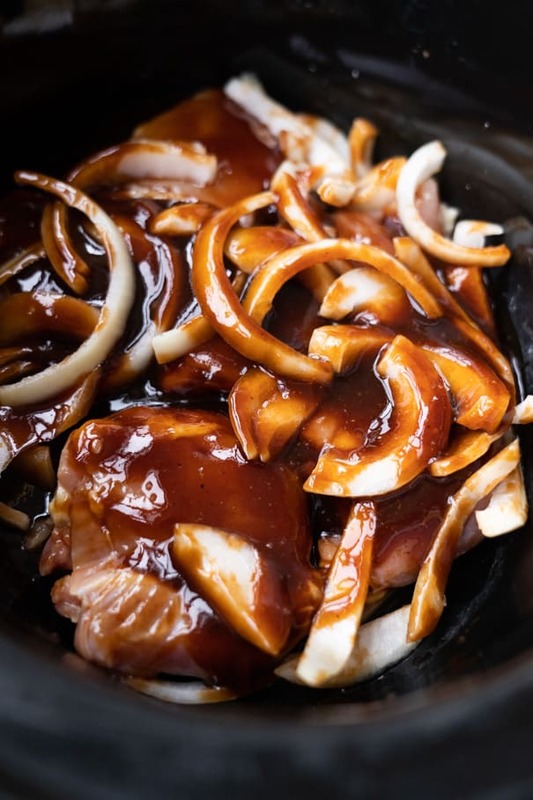 The soy sauce is savory and deep in taste, while the sweet bbq sauce and brown sugar balances out all the flavors. The minced garlic gives it a little bit of a kick. The chicken thighs are going to cook in this sauce for 2 and a half hours, soaking it all up. 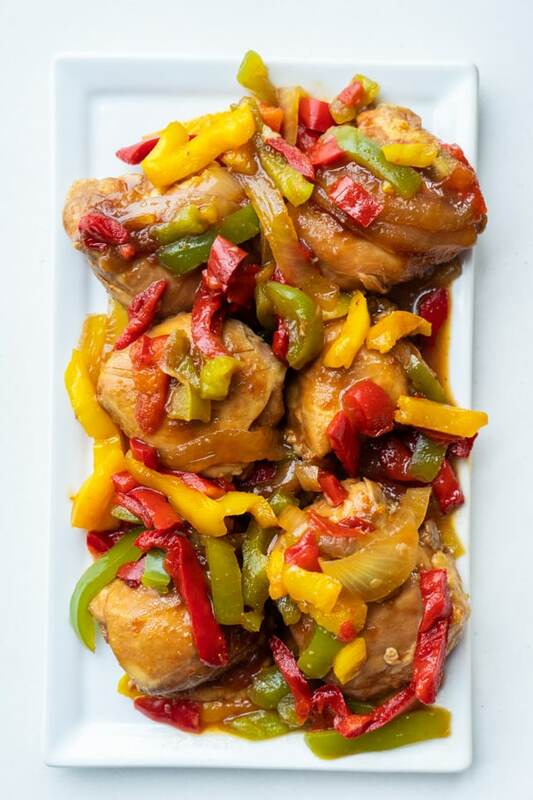 When it’s ready to serve, you’ll have some juicy chicken thighs to eat! Let’s get cooking. 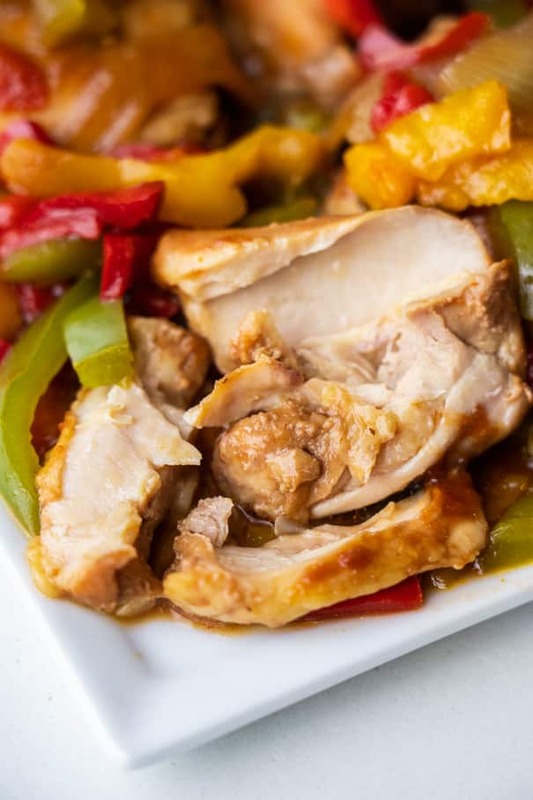 This is how you prepare this slow cooker meal, it literally takes less than 5 minutes. 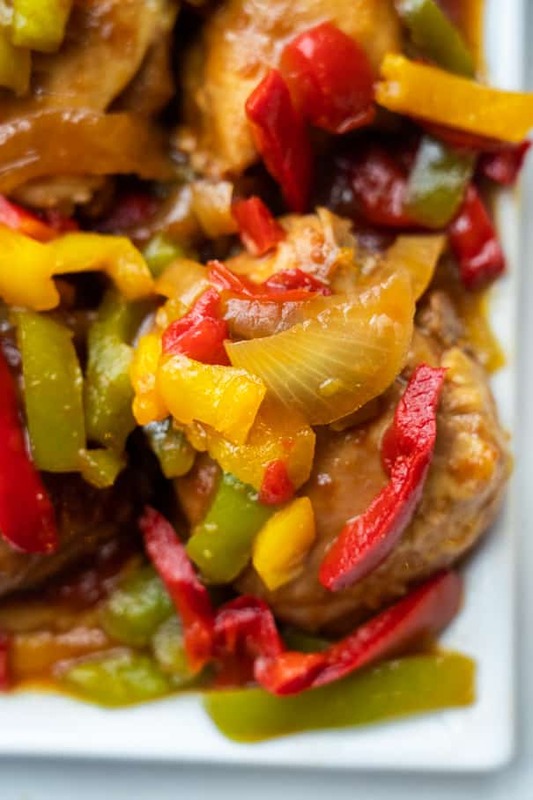 First add the chicken thighs to the bottom of your slow cooker. You could easily double this meal if you want to, just make sure to double the meat and sauce. 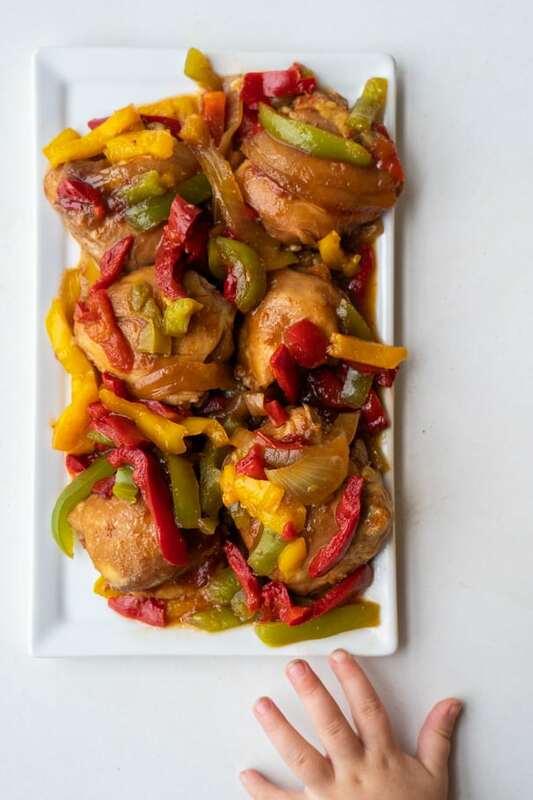 Since these chicken thighs freeze great, I double the batch sometimes to have easy meals on hand for busy weeknights! 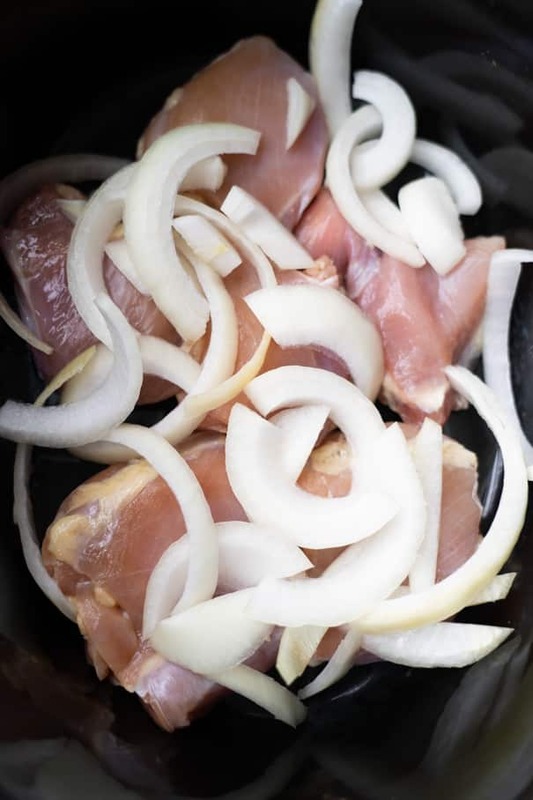 Now add your slices of onions on top of the chicken thighs. Next comes that delicious sauce that we talked out above. I pour this on top to try to cover everything. Ready to relax now? The slow cooker does all the work! Now close the lid and cook on HIGH for 2 hours. After 2 hours is up, add 1-2 teaspoons of cornstarch to thicken up the sauce (if it needs it). I whisk the cornstarch with a fork to prevent any corn starch “crumbs”. At the 2 hour mark, add in a 16 ounce bag of frozen peppers. I like to use a blend of green, yellow and red peppers. Now close the lid again and cook for 30 more minutes on high. And that’s it… Dinner is ready to be served! 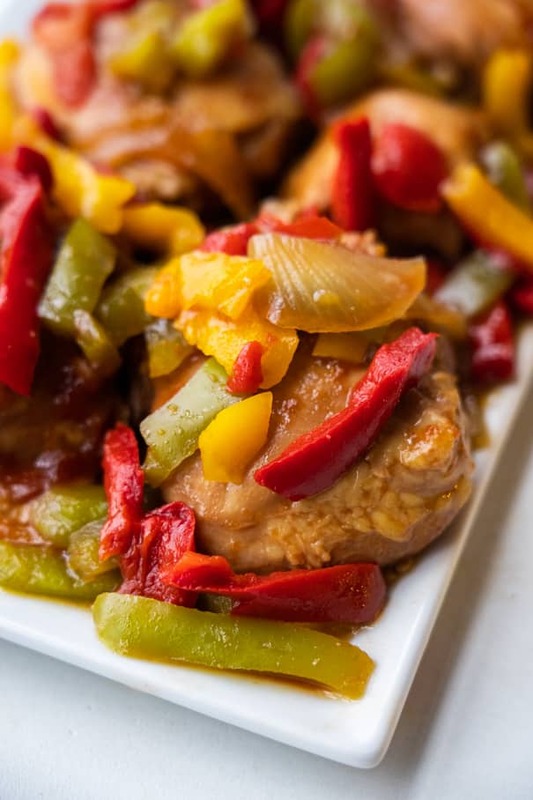 Grab a mixture of chicken thighs and peppers and serve on top of white rice or egg noodles. I made sure this recipe gives you a little extra sauce, so you can spoon that up to pour on top of the rice if you want to! This meal is a family favorite, between adults and toddlers. I wasn’t kidding you when I told you my 1 year old licks her fingers during dinner. Look at these little (and oh so cute!) hands trying to sneak in to grab some! 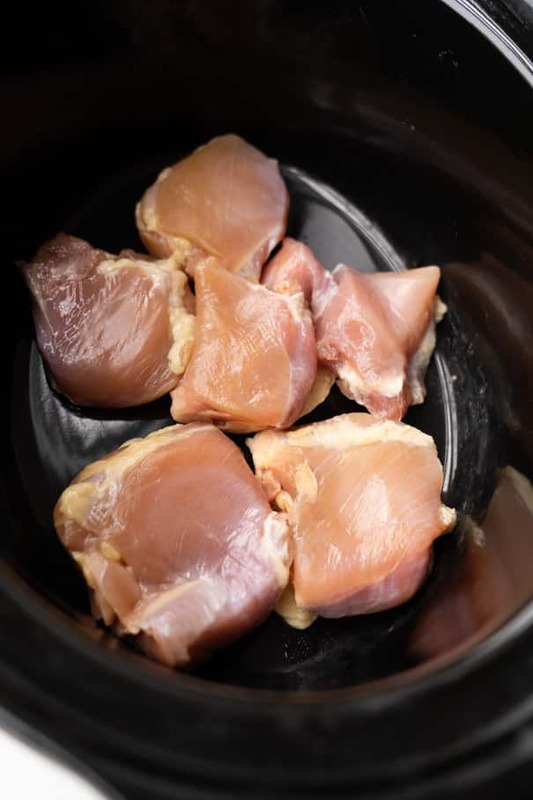 I hope you all enjoy these BBQ Slow Cooker Chicken Thighs! If you’re looking for more Slow Cooker Recipes try my Slow Cooker Whole Chicken and Sausage and Sauerkraut! 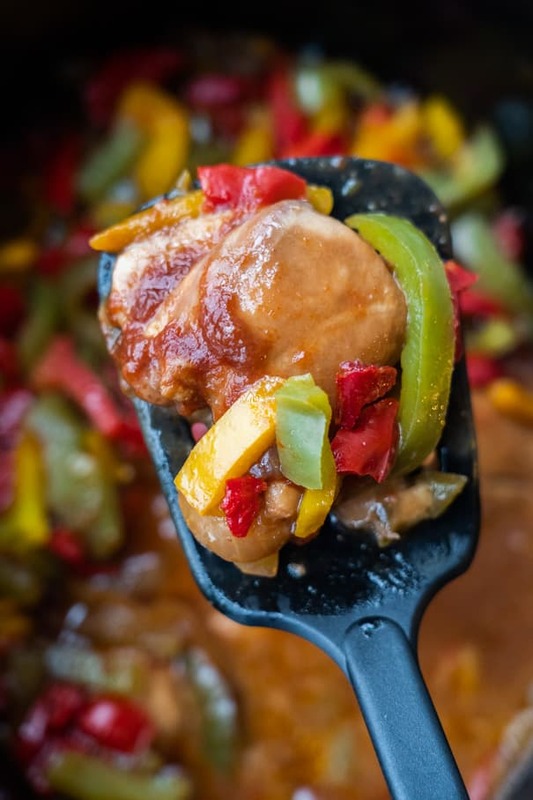 Add chicken thighs to slow cooker on bottom. Add onions on top. 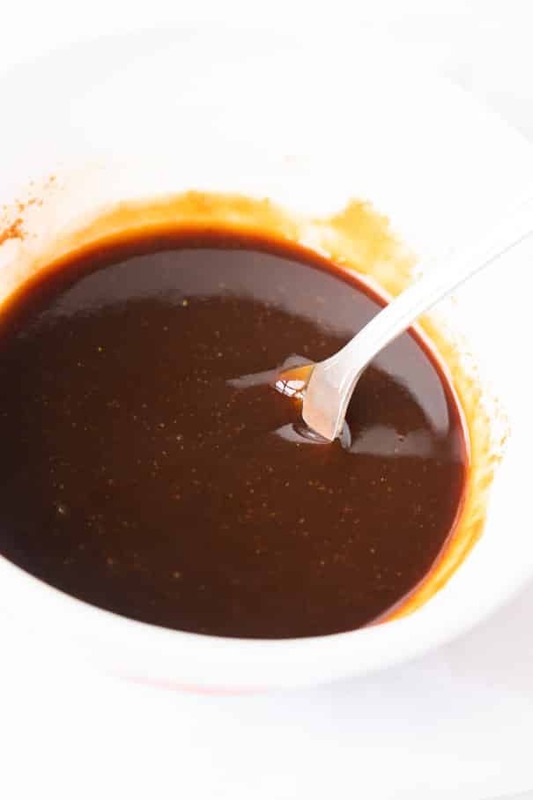 In a bowl mix soy sauce, BBQ sauce, ketchup, brown sugar and garlic together. Pour over onions and chicken thighs. 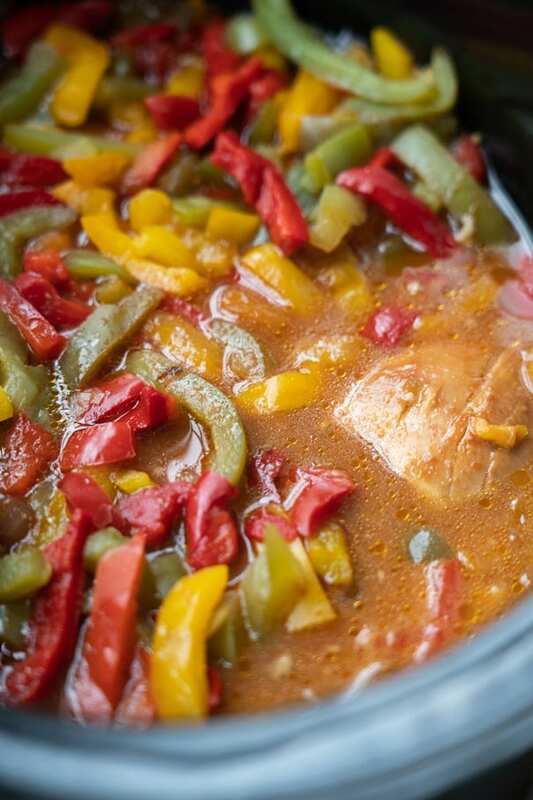 Add 1-2 teaspoons of cornstarch to slow cooker, depending on how much thickening the sauce needs. Use a fork to quickly whisk it so cornstarch doesn't get clumpy. 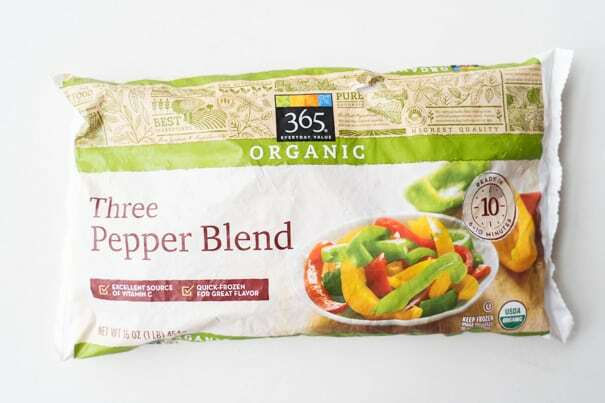 Add bag of frozen peppers to slow cooker. Cook on high for a additional 30 minutes. Serve this meal over rice and enjoy! Finally I made it after two tries. I loved it! And my family enjoyed it too! nom nom this looks so good and easy.